One of the keys to success in online retailing is offering customers with something they can't get anywhere else. Whether it's a unique product or a specific type of shopping experience, to stand out, you have to offer something new. Something different. And that may very well be why Gilt sites and Gilt City are poised to be the next big thing in online sales. Whether you want to buy cupcakes or custom dress shirts online, you can accomplish it with consumer discount sites like this. What is Gilt? Gilt uses a relatively new concept to provide consumers with massive discounts on a variety of designer products. Based in New York, the parent company is called Gilt Groupe and allows regular consumers to grab up luxury and designer items at prices you're more likely to see at sample sales. All luxury items are included like clothing, jewelry, food, and travel. So, you can feasibly get a trip to the Caribbean, custom dress shirts online, and a sinfully sweet gourmet dessert for cheap. Additionally, there is Gilt City, which offers the same sort of discounts and deals but it's organized by location and city, as its name suggests. So, you can get a gourmet meal, a trip to the local high-class spa, and tickets to tomorrow night's concert with just a few clicks and a percentage of the cash you would have otherwise spent. Taking Advantage of Deals Thinking about making the most of the discounts offered by Gilt or Gilt City? All you have to do is sign up to be a member and commit to purchase a deal. Let's say you find a deal on lunch at a gourmet sandwich shop. Maybe sandwiches are normally $10, but with the deal you can get 50% off two sandwiches. You'd click on the "Buy" button and pay for the deal. That means you're getting two sandwiches for the price of one. Then you'll print out a coupon code and bring it to the sandwich shop to redeem. Pretty simple, right? And this same kind of offer applies to luxury items and online purchases like buying custom dress shirts online from stores like EPIC Shirtmakers. Gilt Isn't Alone Sites like Gilt and Gilt City aren't alone in the discount space. In fact, other sites like RueLaLa and even Groupon offer similar deals and coupon experiences. In the case of Groupon, a specified number of people have to commit to purchase the deal before the discount is effective. For RueLaLa, the shopping deals are open to members only and require an invitation to get in. However, if you do become a member, you'll gain access to boutique shopping experiences at private sale prices. 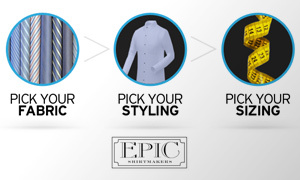 Regardless of where you ultimately do your shopping, member discount, group discount, and local discount shopping sites are dictating the direction of customer purchases and opening up availability to luxury items, like custom dress shirts online, to a wider audience for the first time.